One hundred and nine students have been designated New Leader Scholars, receiving an aggregate of 214 stipends totaling over a million dollars. The Fund provides annual unrestricted stipends, up to $8,000 each, for tuition and/or living expenses. 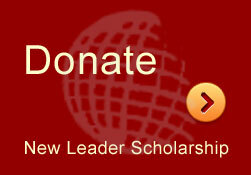 Additionally, the New Leader Scholarship awards up to $2,500 for the application process (e.g. test fees, tutoring and application fees) to graduate school. The Fund uniquely provides more than financial assistance in the form of workshops, seminars, mentoring, career guidance, personal health assistance and the New Leader Scholars network. Typically the stipends have a tipping effect, allowing a New Leader Scholar to participate in a summer research project not otherwise affordable, or to continue community service rather than taking a second part-time job. Watch a video of New Leader Scholar Awards. Since 2005, scholarships have been available for multiple years through graduate school in California public universities. After more than a decade, we can see the outcome of helping incredibly talented scholars exceed their own vision and exercise their leadership potential. In a time of unparalleled financial crisis, they continue with their education and strive to meet their goals for social progress. These are some of their stories.